Looking for the Best Spelunking and Caving Flashlight? When it comes down to extreme caving or spelunking your life can literally depend on your flashlight. Going underground and exploring new depths requires a flashlight or headlamp that can withstand the test. After a few nerve-racking, and exhilarating, trips underground a few of our team members learned what makes a flashlight good for cave exploration. We discovered the best caving light features a hands-free carrying option, has multiple light outputs and has more than 10 hours of runtime. Sometimes in a cave, you will need to use both hands to climb or crawl through a passage and having a hands-free light option can be essential! Moreover, there are times when you are underground that you will want a high light output of 600 lumens or more to see down a hole or further in the distance. But there are small rooms and areas underground where anything more than 50 lumens can be blinding. Optionally, flashlights with red LEDs prevent excessive strain on your eyes after being in the dark for several hours. 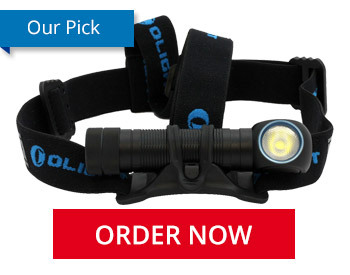 Our top pick for the best caving and spelunking light is the Olight H2R Nova! The H2R Nova comes with two hands-free lighting options: head strap and a pocket clip that can attach to the front of your gear and illuminate the space in front of you. This headlamp runs on a rechargeable Lithium-Ion battery instead of an external battery pack. This prevents you from having to add excessive weight to your gear and the battery pack will not get in your way if you are crawling in tight spaces. And believe us - some spaces get tight! The maximum runtime is 45 days which allows you to go on extended cave explorations without fear of being truly left in the dark. Runtime is critical when it comes to caving lights and the H2R Nova features one of the best runtimes of the lights you could pick. A close runner-up we recommend is the JetBeam HP35. This functions only as a headlamp and cannot be used as a pocket light, but it does feature a bright Red output. The Red LEDs make seeing in the dark less strenuous on your eyes over long periods of time. Plus, this headlamp costs slightly less than the H2R Nova. The reason it came in second place is the lack of a center head strap. After a few hours of use, it gets less comfortable than wearing the H2R Nova. Different types of lights will work best depending on the type of caving and spelunking you participate in. Below are flashlights and headlamps that fit our educated criteria and might be a better fit for you.